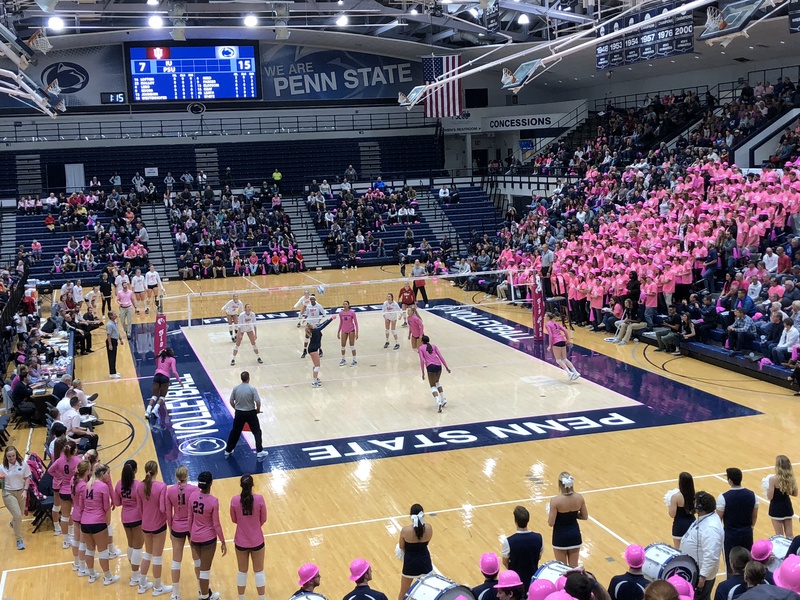 What we took away from Penn State’s 3-0 loss to Hawaii in last evening’s NCAA Regional semifinal in Des Moines Iowa was one word: respect. 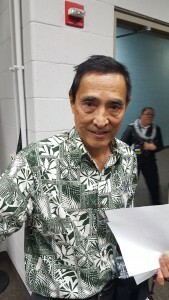 Most striking may have been the deep respect that both Penn State’s head coach Russ Rose, and Hawaii’s head coach Dave Shoji, showed for the other. Perhaps taking after their coaches, or perhaps because they value excellence and appreciate it in others (more on that notion, below), the players for both teams showed they respected and honored the other team. Which leaves us with the always-complex relationship between a sports team and its fans. We hope that if Penn State fans take one thing from this season, it’s that the 2015 Penn State Team earned the right to be shown respect. [Russ Rose] is an unbelievable coach and we feel honored to be in the game and we feel more than honored to win the match. It was quite an effort by our young women. Midway through the first game I thought ‘Hey, we’re playing with them, and I hope our kids believe it, that we can win this match, and they did. They just played their hearts out, and I’m so proud of them. 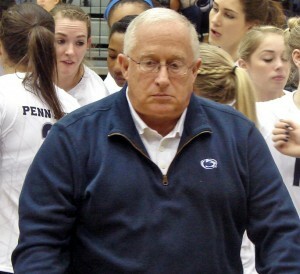 It’s a win against Penn State, not necessarily against Russ Rose. They’ve had our number lately — I just wish we had played them earlier in his career because maybe we would have turned the table earlier, but when you beat Penn State you have to feel good about that, and we do. Russ is a great coach and [Penn State] is going to continue to be a great team, so again, we feel honored to be able to beat them. . . .
[Dave Shoji] is a great coach. It’s a terrific program . . . . I don’t look at it as me against Dave. We’ve known each other for a long time. We’ll want to beat each other during the match, and whoever wins will wish the other good luck, and in that conversation actually mean it. He’s a true guy, and I know that he was disappointed, but I think he was happy for our program, and he wished us well. I’d like to recognize Hawaii on a great match this evening, and appreciate the effort of our seniors and the players that played this year on a season that I thought was an up and down season . . . . Tonight was kind of a reflection of how it was during the year: We had flashes where we looked pretty good, and then times where we couldn’t make the right play or the right decision. But I really think its how well Hawaii played. We made alot of mistakes, and Hawaii didn’t make alot of mistakes — they hit close to .400. Fans — A Little Respect! There are many people, particularly in sports, who think that success and excellence are the same thing. They are not the same thing. Excellence is something that is lasting and dependable and largely within a person’s control. In contrast, success is perishable and is often outside our control. If you strive for excellence, you will probably be successful eventually. People who put excellence in the first place have the patience to end up with success. An additional burden for the victim of the success mentality is that he is threatened by the success of others and he resents real excellence. In contrast, the person that is fascinated by quality is excited when he sees it in others. Coach Rose has achieved remarkable success through his determined pursuit of excellence. Penn State fans have been fortunate enough to witness that success first hand. We’ve been blissfully ignorant of the hard work and sacrifice put in by the players, and the coaches, and the support staff to achieve the excellence that has made that success possible. Lucky us. I said to the team, you’ve had alot of seasons where you’re not having this press conference. We have to keep our heads up, and recognize that when another team beats you, you give them the credit they deserve. Hawaii played terrific tonight. The 2015 team deserves the respect of its fans. The juniors and seniors were members of two NCAA Championship squads, the sophomores one. The team didn’t play its best match last night, but from our perspective, the players never gave up. This coming from someone who was sitting just to the left of where Ali Frantti came crashing into a table in pursuit of a ball, and where Bryanna Weiskircher dove to the floor, with complete disregard to potential injury, to try to come up with a dig. The effort was there, but the team came up short. No need to worry about spoilers — you already know that Hawaii (29-1) knocked Penn State (28-6) out of the NCAA Tournament with a 3-0 (22-25, 25-27, 16-25) win Friday night at the Wells Fargo Arena in Des Moines, Iowa. Two asides: The volleyball court is set on top of an ice skating rink. It is darn cold at courtside. But the Event Staff we encountered at the Wells Fargo Arena were, without exception, as warm and helpful as one could hope for. Big kudos to the University of Northern Iowa for being great hosts. I think Nikki [Taylor — Hawaii’s 6-4 Jr. Opp] reminded the team that we hadn’t dropped Set 2 all year, and I think we got a little inspiration from that. We had several plays that we just couldn’t convert, and it was really frustrating to finally fall behind, but we made the plays when we had to, and managed to steal Set 2. In the timeout, in the back of my head, I was like “Alright, we’re in a bit of a disadvantage, down one, coming into the time out. But I still had faith in our team. I knew the ability we had to convert, because through the whole first set and up to that point in the 2nd we were siding out at a very high rate — within the first or second play. So I was just letting the team know that we hadn’t, in the entire season, dropped a 2nd set, and that was something we needed to hold proud to ourselves, and . . . side out quickly after the time out. We had about three set points: we had an overpass, and a player was not in a good position to make a terminal play on it, and kept the ball in play. We had a couple of overpasses in that game that we should have been able to score with and didn’t. But you have to give credit to Hawaii. Hawaii played great defense. For two teams that were supposed to be good blocking teams, neither team really had much of a presence in the blocking game. We had a game plan, and it didn’t seem to materialize very well. But I really think its more that they had alot more confidence. We had some people that just weren’t in the right mindset to get things done, and that’s our fault as coaches. One of the things we did was have our middle backs — that’s Tai [Manu-Olevao] and [Kalei Greeley] — stay deep, because [Penn State] hit the ball high over our block, and maybe we’d slow it down. So we couldn’t get sucked up into the middle of the court. Our wings, as well, tried to stay wide, to keep everything in front of them. That was kind of the game plan. If they bounced one in front of us, we were just going to chalk it up and go onto the next play. But our game plan was to stay deep and touch some balls, and run transition. 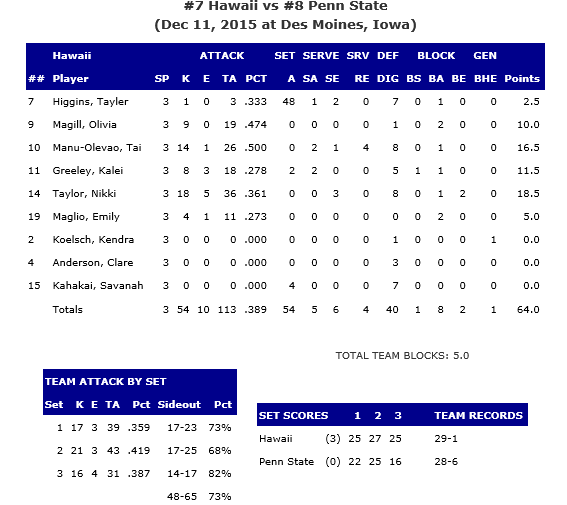 It seemed to work, as Hawaii limited the Nittany Lions to .228 hitting for the match (compared to a .389 attack % for the Wahine). 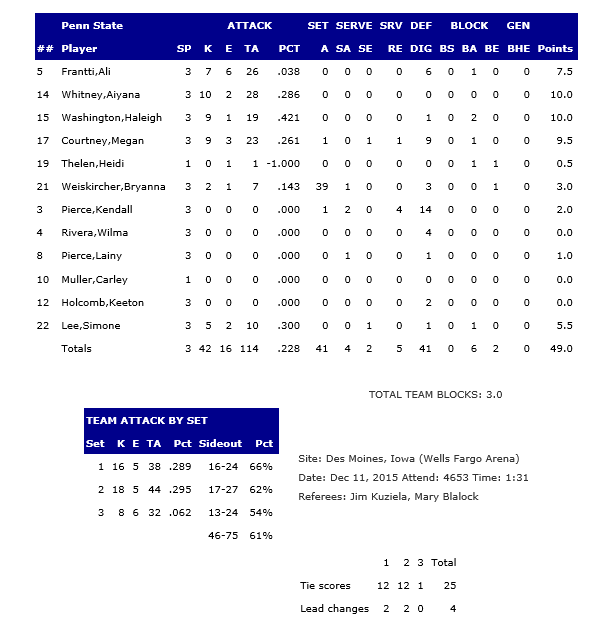 Penn State was led by RS Sr. Aiyana Whitney, who topped the team with 10 kills, Sr. Megan Courtney and So. Haleigh Washington, who followed with 9 kills each, and Sr. Kendall Pierce, who registered a new personal best of 14 digs, adding 2 aces. Courtney totaled 9 digs — second best on the team. 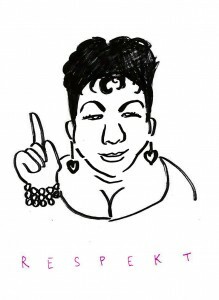 “Aretha Franklin Respekt 2014” by Elise Jakobsen – From a school project at Oslo Academy of the Arts 2014. Licensed under CC BY-SA 4.0 via Wikimedia Commons.